transferred to your Margin Account on a weekly basis. Market Value - The Total Market Value has been calculated out to 9 decimal places, however, the individual unit price is displayed in 5 decimal places. The Total Market Value represents prices obtained from various sources. The accuracy of such prices is not guaranteed. The Market Value of a security may differ from its purchase price. Certain securities may be priced at par value, however, the market value may be significantly different due to liquidity in the market. Certain securities may be unpriced due to the unavailability of pricing data. For fixed income securities, values provided are approximations, not actual market bids or prices, and are provided only as a general guide. Investment decisions should be made only after consulting your broker/dealer. Estimated Yield and Estimated Annual Income - When available, the coupon rate of some fixed income securities is divided by the current market value of the fixed income security to create the Estimated Yield figure and/or the current _____________________________ CUSTOMER SERVICE: Please review your statement and report any discrepancies immediately. Inquiries or concerns regarding your brokerage account or the activity therein should be directed to your broker/dealer at the telephone number and address reflected on the front of this statement and National Financial Services LLC ("NFS") who carries your brokerage account and acts as your custodian for funds and securities deposited with NFS directly by you, through your broker/dealer, or as a result of transactions NFS processes for your account. NFS may be contacted by calling (800) 801-9942. Any oral communications regarding inaccuracies or discrepancies should be reconfirmed in writing to protect your rights, including those under the Securities Investor Protection Act ("SIPA"). When contacting either NFS or your broker/dealer, remember to include your entire brokerage account number to ensure a prompt reply. Please notify the service center of your broker/dealer promptly in writing of any change of address. ADDITIONAL INFORMATION Customer free credit balances are not segregated and may be used in NFS business, subject to the limitations of 17CFR Section 240. 15c3-2 under the Securities and Exchange Act of 1934. You have the right to receive from NFS in the course of normal business operations, subject to open commitments in any of your brokerage accounts, any free credit balances to which you are entitled or any fully paid securities to which you are entitled and any securities purchased on margin upon full payment of any indebtedness to NFS. Interest on free credit balances awaiting reinvestment may be paid out at rates that may vary with current short-term money market rates and/or your brokerage account balances, set at the discretion of your broker/dealer and/or NFS. Credit Adjustment Program. Accountholders receiving payments in lieu of qualified dividends may not be eligible to receive credit adjustments intended to help cover additional associated federal tax burdens. NFS reserves the right to deny the adjustment to any accountholder and to amend or terminate the credit adjustment program. Options Customers. Each transaction confirmation previously delivered to you contains full information about commissions and other charges. If you require further information, please contact your broker/dealer. Assignments of American and European-style options are allocated among customer short positions pursuant to a random allocation procedure, a description of which is available upon request. Short positions in American-style options are liable for assignment at any time. The writer of a European-style option is subject to exercise assignment only during the exercise period. You should advise your broker/dealer promptly of any material change in your investment objectives or financial situation. Splits, Dividends, and Interest. Expected stock split, next dividend payable, and next interest payable information has been provided by third parties and may be subject to change. Information for certain securities may be missing if not received from third parties in time for printing. NFS is not responsible for inaccurate, incomplete, or missing information. Please consult your broker/dealer for more information about expected stock split, next dividend payable, and next interest payable for certain securities. Equity Dividend Reinvestment Customers. Shares credited to your brokerage account resulted from transactions effected as agent by either: 1) Your broker/dealer for your investment account, or 2) through the Depository Trust Company (DTC) dividend reinvestment program. For broker/dealer effected transactions, the time of transactions, the exchange upon which these transactions occurred and the name of the person from whom the security was purchased will be furnished upon written request. NFS may have acted as market maker in effecting trades in 'over-the-counter' securities. Retirement Contributions/Distributions. A summary of retirement contributions/distributions is displayed for you in the activity summary section of your statement. Income Reporting. NFS reports earnings from investments in Traditional IRAs, Rollover IRAs, SEP-IRAs and, Keoghs as tax-deferred income. Earnings from Roth IRAs are reported as tax-free income, since distributions may be tax-free after meeting the 5 year aging requirement and certain other conditions. 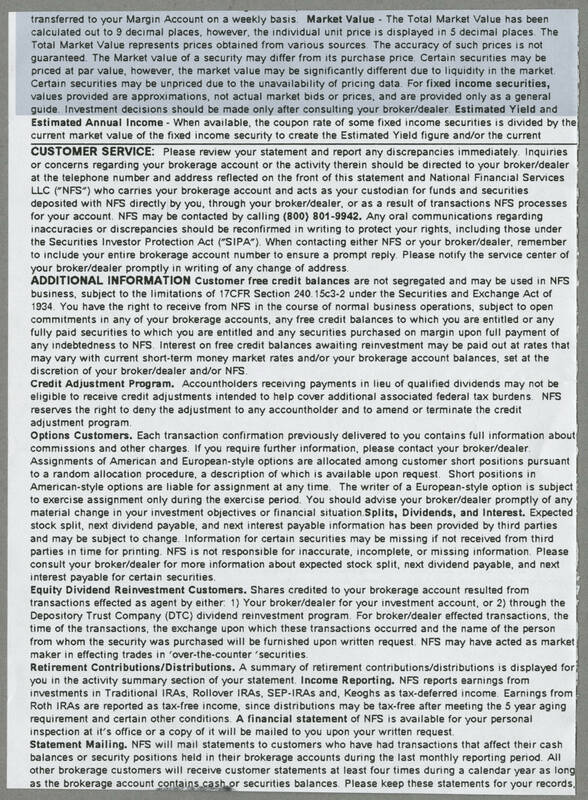 A financial statement of NFS is available for your personal inspection at it's office or a copy of it will be mailed to you upon your written request. Statement Mailing. NFS will mail statements to customers who have had transactions that affect their cash balances or security positions held in their brokerage accounts during the last monthly reporting period. All other brokerage customers will receive customer statements at least four times during a calendar year as long as the brokerage account contains cash or securities balances. Please keep these statements for your records.